Coal consumption by educational institutions such as colleges and universities in the United States fell from 2 million short tons in 2008 to 700,000 short tons in 2015. Consumption declined in each of the 57 institutions that used coal in 2008, with 20 of these institutions no longer using coal at all. Many of these institutions participate in the American College and University Presidents Climate Commitment, a program aimed at reducing greenhouse gas emissions. 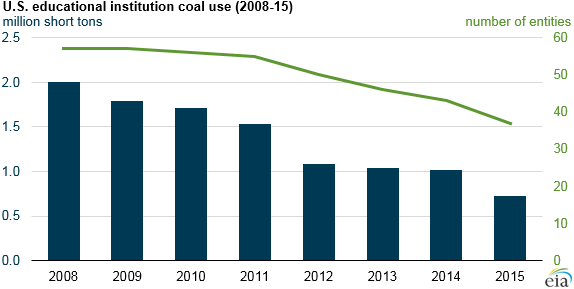 Coal consumption has decreased as institutions switch from coal to natural gas or other fuels. Coal use at educational institutions is small, making up less than 0.1% of total coal consumption in 2015. But coal use at educational institutions has a long history. Many educational institutions used coal to produce their own electricity and heat as early as the 19th century, when access to the electric grid was limited. The Public Utility Regulatory Policies Act of 1978 allowed many independent power producers, including institutions, to sell their surplus electricity back to public utilities, further encouraging educational institutions to generate their own electricity. Educational institutions in New York, South Carolina, Idaho, and South Dakota ceased to use coal between 2008 and 2015. These institutions either built or expanded their natural gas capacity, aided by state funding, or increased their electricity purchases from public utilities. The largest reductions in coal consumption by educational institutions between 2008 and 2015 occurred in Indiana, Michigan, Missouri, and Tennessee. Educational institutions in Indiana collectively reduced coal consumption by 260,000 tons (81%) from 2008 to 2015. Coal was replaced mostly by natural gas and geothermal heat to meet sustainability initiatives set by each university. Educational institutions in Michigan reduced their coal use by more than 80% over this period, adopting natural gas as the major fuel. Some institutions in Missouri added more renewable sources of power, replacing coal with biomass. 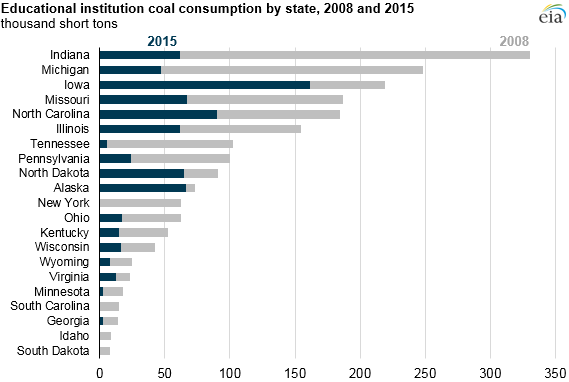 Three institutions in Tennessee stopped using coal between 2008 and 2015, resulting in a 94% drop in coal consumption by institutions in the state. Many of their cogeneration plants were converted to burn only natural gas.